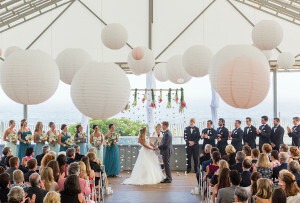 Step inside their stunning summer camp-inspired soiree in Kennebunkport. By Rachel Kashdan·	 11/30/2018, 2:03 p.m. 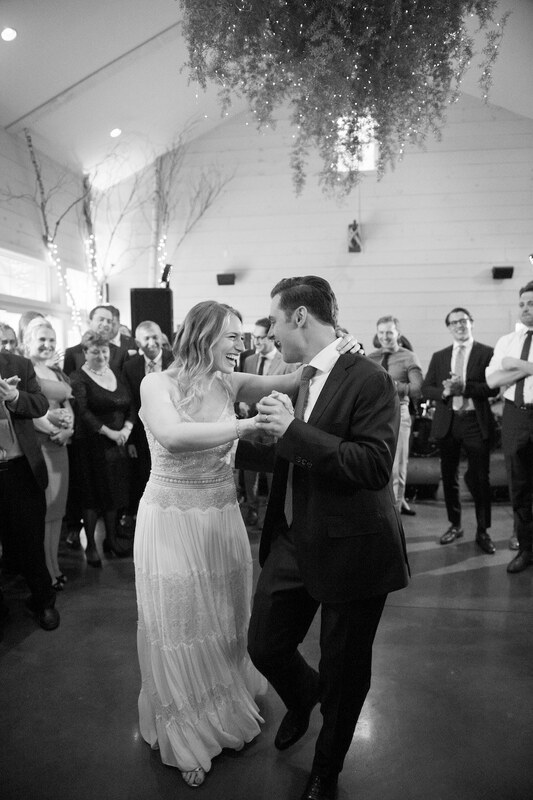 In April 2014, Lauren Lacoff and Leo Muchnik met in a very 21st-century twist of fate. Lauren stumbled upon Leo’s profile on the dating app Coffee Meets Bagel, which included a picture of him with one of Lauren’s friends. “I took a screenshot and sent it to her, and she was like, ‘Oh yeah, he’s cute and normal, you should go out with him,’” Lauren recalls. The two went on their first date within a few weeks and from then on Lauren “never dated anyone again,” she says. Wedding planning began immediately. 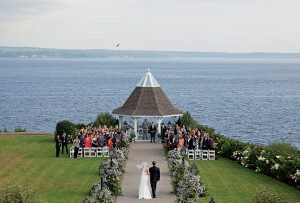 After they broke the news of their engagement, Lauren’s parents recommended they visit Hidden Pond resort in Kennebunkport. They reserved the venue that same weekend. “It was just kind of meant to be. 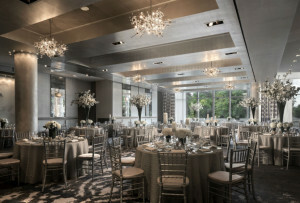 They only had one date left, so we booked it pretty much on the spot,” the bride says. The vibe for their wedding weekend? “Five-star summer camp for adults,” Lauren says. 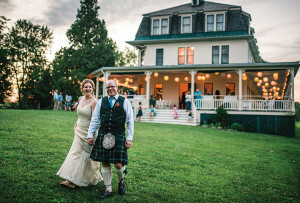 The couple rented out the woodsy property, where they and their guests spent the weekend relaxing in the resort’s cozy bungalows, riding bikes, strolling along the beach, and roasting s’mores on the bonfire. 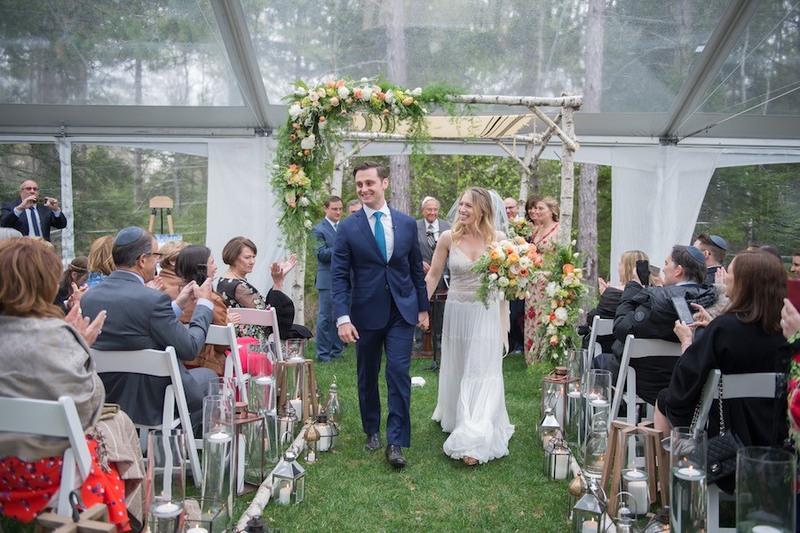 Their ceremony and reception décor also drew inspiration from nature, complete with white birch accents and lively, loose florals in peach, orange, and soft yellow hues. “It just had a really easy feel to it and it was all very organic,” Lauren says. 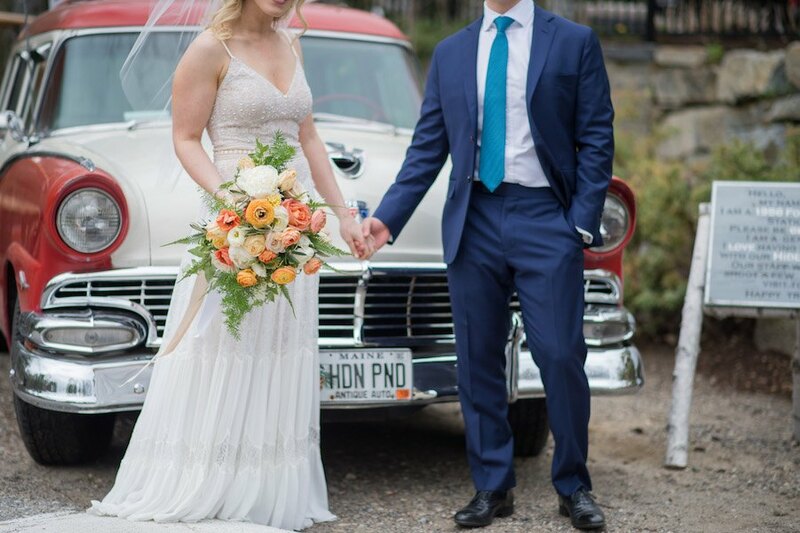 Hidden Pond’s vintage Ford station wagon (named Bessie) provided the perfect backdrop for the couple’s wedding portraits. 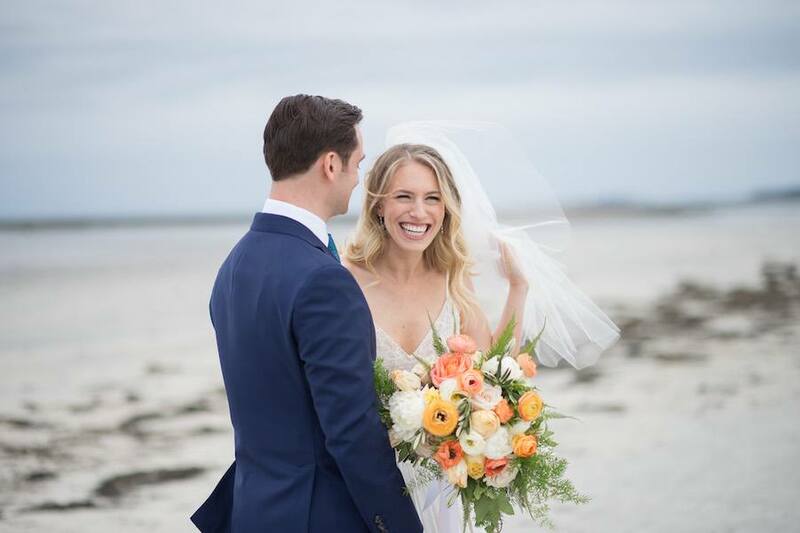 The bride, who says she’s “not really a ballgown-type-girl,” wore a dress by Inbal Raviv. 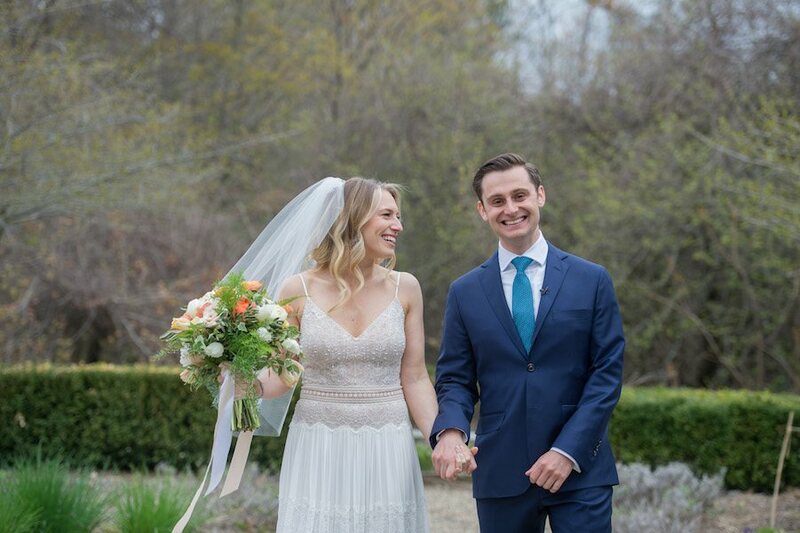 At their tented ceremony, the couple exchanged vows under a white-birch chuppah adorned with roses, bleeding heart, ranunculus, ferns, olive leaf, and a Jewish prayer shawl from Leo’s grandfather. 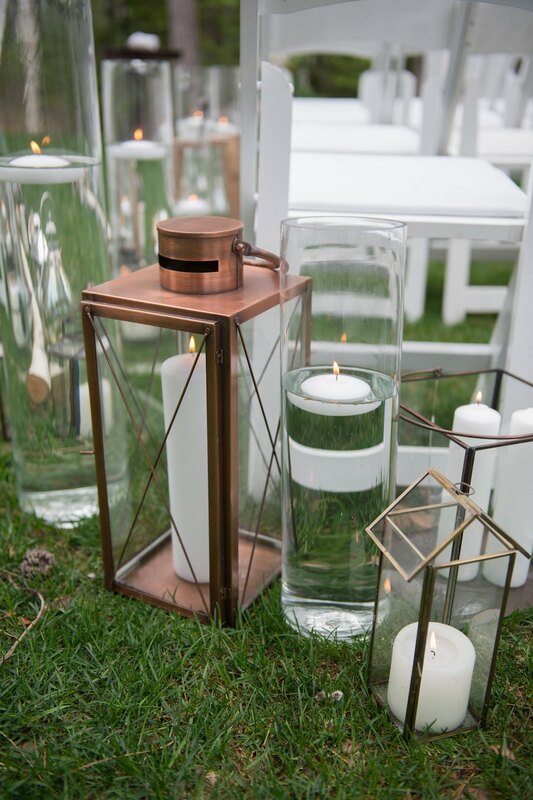 White candles, inside lanterns and floating atop water-filled vases, lined the ceremony aisle. Blankets placed on guests’ seats added extra coziness on the crisp May day. Dinner took place under a tent outside of the event barn just as the sun started to set. 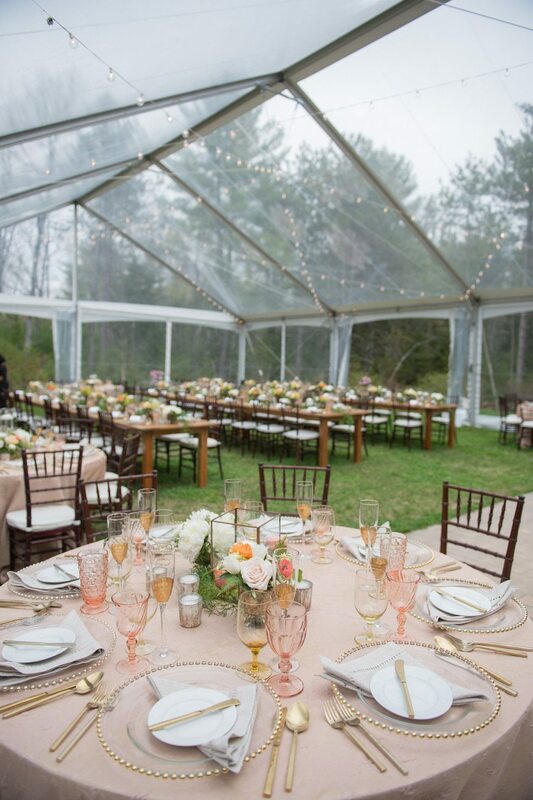 The space featured long wooden farm tables as well as round tables with textured rose-gold tablecloths, glass chargers, gold flatware, and peach-pink goblets.